I recently got this and thought it was a good subject to talk about. 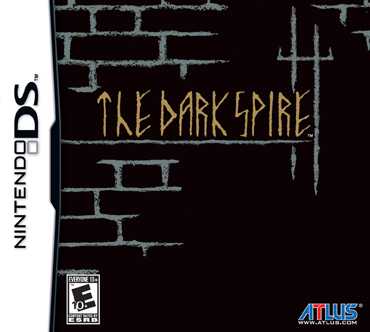 The game is based on the "Chronicles of the Dark Sword" legend and one of Drake's plays, and that is revealed as a note in the beginning of the game. Quoting that the creators "Didn't want to focus too much on historical accuracy, but make something more familiar". Character wise: You can choose four default characters (Gustav, Emile, Royce, and Martin), make a party of four yourself, or mix and match. Though, as a beginner, you may want to use the defaults because they are all level 2 in their professions and characters you make are always level 1. Did you know you can basically commit murder in the training area? This always happens, you go into combat training and end up killing the guy, oh dear... Fortunately a mage is on site with a high-level healing spell. This game sports the new 3D graphic look most DS games have, but you can change that! Like in the picture above, you can go and change the display from Modern to the Classic wire-frame look seen in most 80s RPGs. The display includes models detailed like they're from Mother 1. What? Can't I reference something? Also, it includes the 8-bit music. If you get it brand new from Amazon, you are likely to get it in a box. And in that box is not only a game, but a CD of the music tracks.